Logan Essig (left), Cailey Rooker (center) and Mason Dirlam (right) enjoy a moment together before playing Pebble Beach Golf Links. The trio competed in the PURE Insurance Championship as part of The First Tee program. 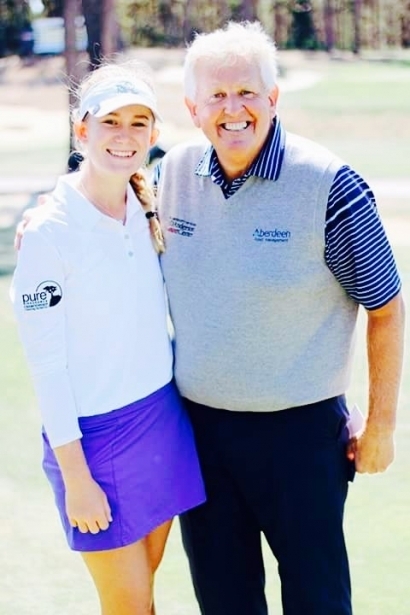 Cailey Rooker gets ready to compete in the PURE Insurance Championship with her partner, Colin Montgomerie. 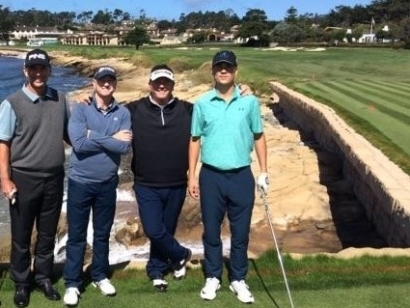 Champion Tour pros Kevin Sutherland (left) and Steve Flesch joined Paul Goydas and his partner, Mason Dirlam (right) for a practice round at the PURE Insurance Championship. Dirlam and Goydas finished 13 under par. Lakeshore High School's Logan Essig tees off during his practice round for the PURE Insurance Championship held at Pebble Beach Golf Links and Poppy Hills Golf Course. 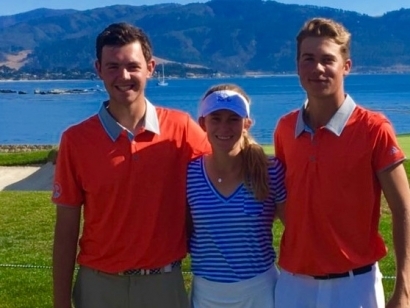 Mason Dirlam, Logan Essig and Cailey Rooker got to experience what many golfers have on their “Bucket List”, playing Pebble Beach Golf Links, not to mention playing with Champion Tour professionals in front of galleries and Golf Channel’s national TV audience. Eighty-one First Tee golfers were invited to play in the unique PURE Insurance Championship. Lanny Watkins, former tour professional and analyst for the Golf Channel put it this way, “its mind boggling the opportunity these kids have.” Rocco Mediate said “just look at their eyes and see the determination and excitement”. Dirlam was teamed with Paul Goydas, Rooker with Colin Montgomerie and Essig with Gibby Gilbert III. There is no better way for our readers to experience their excitement than having the three describe the week. Dirlam:The first day we checked in and got admitted. Everything was paid for me and my parents. We were given access to any mid-size car, got jackets and shirts from the sponsor, PURE Insurance. At dinner we met our professionals. Rooker: They went all out to make it feel like a professional event. It was beyond my expectations. 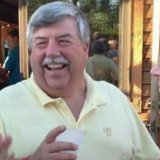 Essig: Got to go to a Colt Ford concert. I’m a big country music fan. 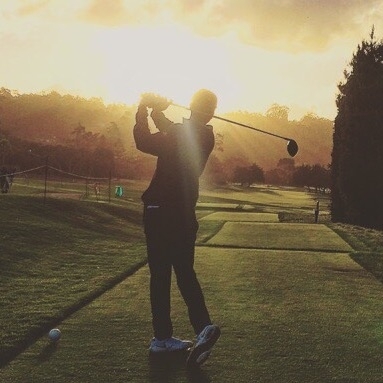 Dirlam: The second day we started at 7AM at Poppy Hills. Paul Goydas brought along Keith Flesch and Kevin Sutherland. My dad (Michael) caddied and he got to meet everyone. I was really nervous on my first drive. Essig: Got to attend a Chris Young concert with all the pros. Rooker: I got to play with Tom Watson on Thursday. He gave me lots of good tips, especially on how to putt at Pebble Beach. Dirlam: We played Pebble Beach. On Number 7 it was real crazy. I hit a 90-yard wedge shot with birds flying over you and the waves crashing. It was incredible. Essig:I really didn’t hear them (birds). I was so focused I didn’t hear anything. Rooker: I had a great start the first day. I played really well at Poppy Hills. The weather was amazing. Dirlam: I had two birdies. We finished four under and were solid in the standings. I was getting acclimated to a professional tournament. Essig: I was definitely nervous, but I handled it pretty well and made a birdie putt on nine. Hard to believe how cool everything was. Rooker: We were at Pebble Saturday. Teeing off I was a little nervous, but after the first two shots it was exciting. I kept thinking I’m really here. This is really cool. Dirlam: We had an early morning tee time. There’s not a lot of room for error. It was very stressful. I remember on 14 the electronic scoreboard said we were tied for ninth. I wasn’t too ecstatic, but was in better spirits. We birdied four of the last five holes. I birdied 17 and Paul birdied 18. Dirlam: I got a text from Paul that evening. We had a 10:17 tee time Sunday. I thought now I really have to focus. There were probably two or three times more people watching us, plus the Golf Channel lady. We finished 13 under. There were many more highlights during the week including Rooker’s shot on number one at Poppy Hills making the opening highlight on Friday’s telecast, being interviewed live with Montgomerie on Saturday and dinner with Dirlam, Kevin Sorbo (Hercules) and Alphonso Ribeiro (Fresh Prince of Bel-Air).